With emerging trend of huge display screen smartphones, Apple kept up and as a result launched iPhone 6 plus in September 2014. Upgraded cameras, upgraded software, large display screen are some of the great features of this attractive, elegant iPhone series. Though expensive, it has all the new inbuilt technology that is present in the latest versions of smartphones. Facing any of the above problems? Contact us and get your problem sorted out completely on the same day in an hour. 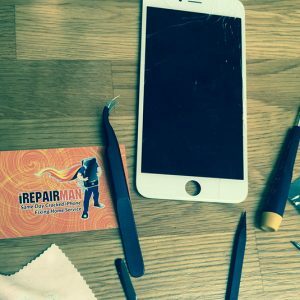 iRepairMan is a repair service which rids you of the problems relating to mobile phones especially Apple iPhones. iPhone 6 plus has its line of followers, although very popular its problems have increased especially with latest updates of iOS. Our well trained and experienced technicians are well aware of the problems of this model and expertly repair it and also guide you about its future use. A- Call or text our customer care on 07506011774 or email us at [email protected] or submit an online form on our website. B- Within an hour, you will be contacted by our local technician (also called iTech) who is specific for your area. Our company provides services to all the areas of London and surrounding area within 15-20 miles of Baker Street Station. C- You make an appointment with our iTech according to your feasibility. Decide a time, day and place and our iTech will meet you there and then. D- On the scheduled day, our expert iTech meets with you and repairs your phone in front of you. You can then pay him and get one-year warranty on the repair. Our services are very cost-effective and reliable. All our technicians are DBS cleared.